S1A Porretta T.- Bologna C.
S1B San Benedetto V.S-Bologna C.
At the time of the early agreements for the new Milan-Bologna-Florence high speed railway line, in 1994 the Ministry of Transport, the Municipal authority of Bologna, the Province of Bologna, the Regional Government of Emilia-Romagna, FS SpA and TAV Spa entered into a “Memorandum for the definition of a new public transport solution for the urban area of Bologna”, which acted as the foundation of the Servizio Ferroviario Metropolitano bolognese (SFM) project. This document outlined the terms, requirements and commitments of the parties for the creation of a new public transportation solution for the Bologna metropolitan area. The “Comitato per il Nodo ferroviario di Bologna” is the supervisory and control body with power on the implementation of the obligations entered into by the parties. The Province of Bologna is the lead of the Comitato per il Nodo Ferroviario di Bologna. The Metropolitan Railway Service (SFM) was born in 1994 at the same time of the new the new Milan-Bologna-Florence-Naple high speed railway line. The construction of a new line and a new underground Bologna Central Station, dedicated to long-distance services, it involves the release of the surface rail for regional and local trains. 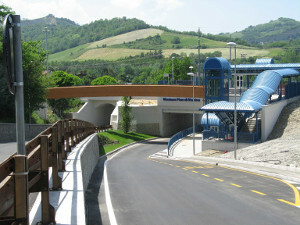 The project provides for the transformation of the existing railway branches into 4 through lines and 1 line centred in Bologna Central Station (for a total network of 350 Km, of which 70 within Bologna); the building of 16 new stops, of which 8 within the town of Bologna; the renovation of most existing railway stops and synchronized and coordinated timetables. The service quality is based on a 30'/60' synchronized and coordinated timetable model from 6.00 to 24.00 and the concept of symmetry hour knot (crossing point between two railway lines for interchange with buses) and a regular offer for all stations/stops. The project provides also for a strengthening of the service in rush hours, especially for the farthest stops with an hourly schedule synchronization for the rest of the day. The Metropolitan Railway Service project will be included in an integrated and intermodal offer of public and private transportation. As a result of the full realization of the project, we expect that the SFM will capture a quarter of the trips between Bologna and the rest of the territory (about 100,000 to 400,000 trips/day). Currently the result of 70% in terms of trains per day was achieved by SFM project. Its full implementation will be possible only after the opening of the new underground station on June 2013 and the restoration of the rails of the Bologna Central Station expected in 2016. The Regional authority is in charge of the entire programming, administrative and financing processes, with the exclusion of safety, competence of the State. More specifically, the Regional authority is in charge of the regional railway transportation service. Within such service, Regional Law no. 30 of 1998 provides for the programming and design activities of the Servizio Ferroviario Metropolitano bolognese (SFM - Bologna Urban Railway Service) to be performed by the Regional authority in bundle with the Bologna Municipal and Provincial authorities. The current call for regional railway services took place as a European tender supervised by the Regional authority and involving a single package of services. As of July 1, 2008, the service has been given to Consorzio Trasporti Integrati (held by Trenitalia and TPER), the tender appointee, under a three-year Service agreement executed on March 31, 2008 and currently extended until the new call for procurement, expected to take place in 2013.